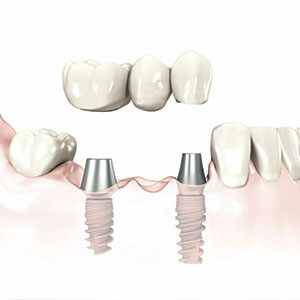 Periodontal Associates proudly offers a wide range of dental implants in Newton and Framingham, MA. Contact us today to schedule your dental implant appointment. Dental implants are the best and most conservative choice for “permanently” replacing one or more missing teeth. This remarkable advancement in dental treatment has dramatically changed the quality of life for thousands of our patients by restoring health, chewing ability, and beautiful, natural smiles. A dental implant is a substitute tooth root that is used to replace the natural tooth in any area of the mouth where a tooth is missing. Just like your own natural tooth, the implant is anchored in bone. 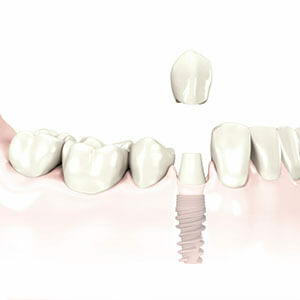 Typically, an “abutment” is connected to the top of the implant, and extends through the gum. 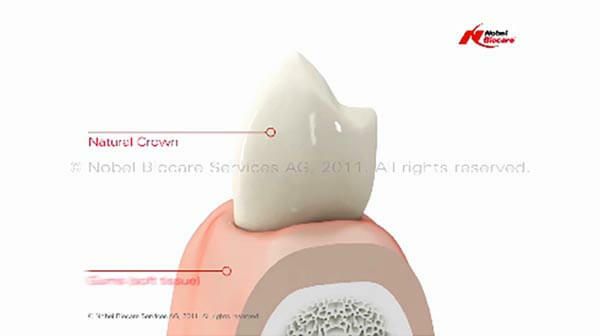 The “crown” or visible part of the tooth is then connected to the abutment in a variety of designs (see diagram). Dental implants provide a strong, solid foundation for biting and chewing. And, teeth supported by dental implants look and feel just like your natural teeth! Dental implants are made of titanium, a biocompatible material that is accepted by the body. With a success rate of greater than 95%, dental implants have the best long term prognosis of any method of tooth replacement. The scientifically-based method of implant treatment was first developed around 1960 in Sweden. Dr. Per Ingvar Branemark observed that a titanium implant could naturally and predictably bond with bone. This phenomenon was termed “OSSEOINTEGRATION”. Since the original implant was placed several decades ago, millions of patients have enjoyed the benefits of successful “permanent” tooth replacement with dental implants. 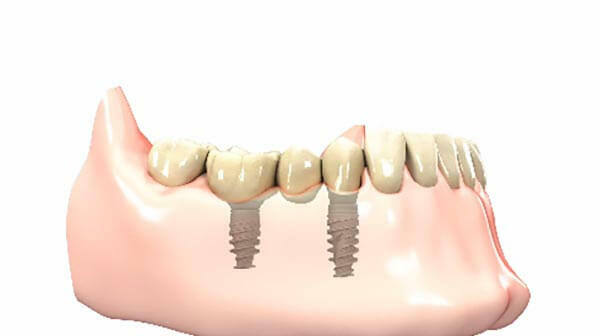 Dental implants preserve the bone and facial structure. When a tooth is lost and is not replaced with a dental implant, the jawbone undergoes deterioration. This process, called “resorption”, continues throughout life. Bone deterioration from complete tooth loss leads to collapsed cheek and lip support, increased wrinkles around the mouth, and a prematurely aged appearance. Fortunately, dental implants preserve the jawbone, just like healthy natural teeth. The bone is actually strengthened by the forces of chewing. Strong, healthy bone and dental implants will give you a more youthful appearance, and help maintain a beautiful smile for a lifetime. Achieve the most natural result. By replacing the entire tooth, including the root, the function of teeth is reproduced. Implants provide a strong, stable foundation for comfortable biting and chewing. Teeth look and feel just like your own natural teeth. Adjacent teeth are not damaged. When missing teeth are replaced with traditional natural tooth-supported fixed bridges, the healthy teeth on either side of the space must be ground down so the bridge can be cemented. The natural tooth structure is gone forever. Oftentimes, the nerves of the supporting natural teeth die and require root canal treatment. Natural tooth bridges can loosen over time resulting in dental decay around the teeth. When missing teeth are replaced with traditional removable partial dentures, the metal clasps must be hooked onto the natural teeth to provide support. Over time, the pressure of chewing rocks these teeth and can lead to bone loss and extraction. With implant supported teeth, the adjacent natural teeth are not damaged or compromised in any way because they are not involved with the treatment. Implant teeth are the most conservative treatment option to restore your beautiful smile and chewing ability. Achieve the best quality of life with replacement teeth that function just your own natural teeth. Teeth supported by dental implants can be customized to your individual needs and wishes so that you may regain your beautiful, natural smile and appearance. They will feel just like natural teeth, and you will be able to eat any food that you want. You will have a renewed confidence and self esteem for a lifetime. Avoid the problems of loose, painful, poorly fitting removable dentures. Since dental implants bond with the bone to provide superior function and prevent bone loss, your replacement teeth will not move. You will eat normally, be more comfortable, and be able to speak and socialize with confidence. Dental implants are the most reliable and cost-effective long term treatment solution. Implants do not get dental decay or require root canals as do natural teeth. With a treatment success rate of over 95%, thousands of our patients have enjoyed the benefits and predictability of dental implants for the past three decades! Implant teeth are easy to care for. You brush and clean them just like your own natural teeth. And with regular routine dental hygiene appointments for professional cleaning, you are sure to enjoy your teeth for years to come. During the examination process, Dr. Feuerman or Dr. Castellucci will evaluate the overall condition of the mouth. Information is gathered regarding the health of the gums, density and amount of underlying bone, position of the remaining teeth, and the bite. Routine x-rays will be necessary to help visualize the teeth and jawbone. In many cases, a more sophisticated 3D CAT SCAN will be required to precisely determine bone contours and the position of vital anatomical structures. Impressions may be taken to make models of the teeth and gums, which add to the careful analysis process. The doctors will also evaluate whether additional procedures may be needed to achieve the best functional and esthetic result. If you have already lost a significant amount of bone and gum, grafts may be needed to increase support for the implant teeth. All of the information collected will be used to develop a treatment plan specific to your needs. Dr. Feuerman or Dr. Castellucci will also determine whether you are a candidate for Immediate Function procedures. This type of treatment allows you to have temporary teeth placed at the same time as the dental implants, all in one day. Oftentimes, it is done at the same time as removal of natural teeth. However, some patients are not good candidates for this procedure. In these situations, a traditional implant treatment sequence will be followed. 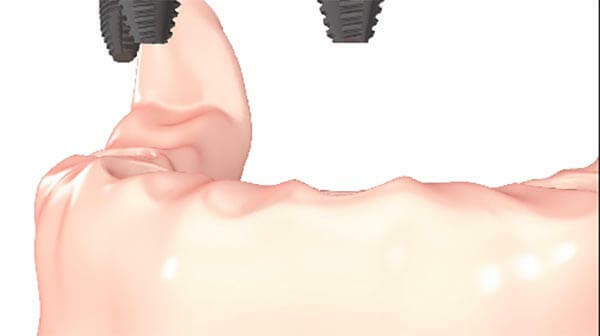 Using regular dental anesthetic, the dental implant is placed into the jawbone using a precise and gentle surgical technique. Most patients experience no major discomfort after the procedure. The dental implant fixture will be left undisturbed in the jawbone for a period of several weeks. The bone forms a strong bond to the implant and osseointegration takes place. During this time, you will have temporary replacement teeth so that you never have to be without teeth during treatment. Once osseointegration of the implant is complete and the dental implant is firmly anchored in the bone and gums, a small connector post called an “abutment” is attached to the implant. This abutment passes through the gum and will support the new tooth. Your dentist will take an impression of the implant or abutment and will work with the lab technician to make the new replacement tooth. This process can take a few weeks depending upon the number of missing teeth and the type of restoration. Your dentist will attach the final tooth or teeth and your chewing ability and beautiful smile will be restored! Immediate Function procedures can be used for the replacement of one tooth, a few teeth, or a full set of teeth. The temporary replacement teeth are usually placed immediately following implant placement – all in one appointment on the same day. The final teeth are placed a few months later. With this procedure, patients never have to go without teeth or use a temporary removable denture. A dental implant-supported crown is the most ideal treatment for replacement of a single missing tooth and has become the standard of care in dentistry today. Although a single tooth may be replaced with a traditional tooth-supported bridge, it is a less desirable treatment option. With a bridge, the natural supporting teeth have to be ground down in order to fit the cemented bridge in place. The nerves of the teeth may die and root canal treatment will become necessary. The natural teeth may also decay which could lead to loss of the bridge and the natural teeth. Fortunately, single implant teeth are “self contained”, and do not affect the adjacent natural teeth in any way. The single implant tooth will look and feel just like a natural tooth, and is the most conservative, predictable and long-lasting treatment option. Implant teeth do not decay. Implant teeth do not require root canals. Adjacent natural teeth are not ground down. Implant teeth look, feel and function just like a natural tooth. Implant teeth have a greater than 95% success rate. Implant teeth are the most conservative and predictable long term solution. Single implant teeth are easier to clean than natural tooth bridges. When multiple teeth are missing, treatment options for replacement include dental implant-supported crowns and bridges, “long span” bridges supported by natural teeth, and removable partial dentures. Implant-supported teeth are the treatment of choice, and have become the standard of care in dentistry today. “Long span” bridges supported by natural teeth generally fail over time due to the forces of chewing. Decay or fracture of the supporting teeth is common, and may result in loss of the teeth. The natural teeth have to be ground down in order for the bridge to be cemented in place. Oftentimes, the nerves of the teeth die and root canal treatment becomes necessary. With removable partial dentures, clasps are hooked onto the supporting natural teeth. Over time, the pressure of chewing rocks these teeth and can lead to bone loss and extraction. Fortunately, implant-supported crowns and bridges are “self-contained” and do not damage the adjacent natural teeth in any way. The implant teeth will look and feel just like natural teeth, and are the most conservative, predictable and long-lasting treatment option. Adjacent natural teeth are not ground down or loosened by denture clasps. Implant teeth look, feel and function just like natural teeth. Years ago, the only option to replace all missing teeth was a complete removable denture. This treatment option is a poor long term solution because the jawbone continually deteriorates and shrinks over time. Dentures loosen and become painful. This, in turn, results in poor function because patients cannot chew or taste foods the way they could with natural teeth. Speech is compromised, and dentures can fall out when eating and speaking. The structures of the face and lips collapse inward resulting in a prematurely aged appearance. Self esteem and confidence are lowered because of the uncertainty and insecurity associated with dentures. Fortunately, dental implant-supported teeth can be used to replace all of the missing natural teeth. The implant teeth will look and feel just like natural teeth, and are the most conservative, predictable and long-lasting treatment option. Your quality of life will be improved and your beautiful smile will last a lifetime. Implant teeth provide the strongest chewing function. Questions? Contact us today to learn more and schedule your appointment.